Our family history is a treasured memory that we all want to pass on to future generations. Grandma’s best pie recipe, the photo at the family reunion, and the wedding gifts that remind you of a special someone. 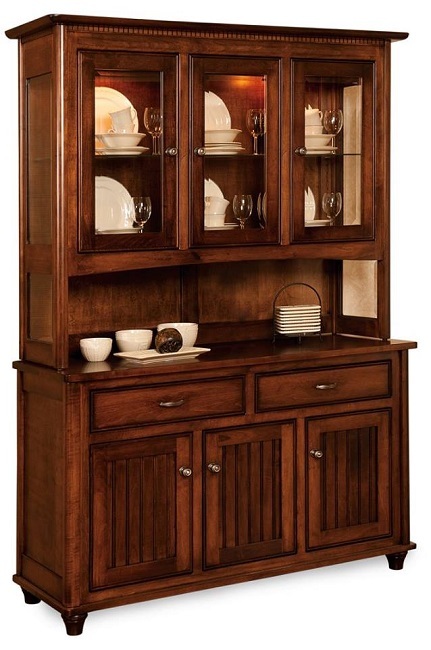 The dining room china cabinet is a versatile piece of furniture that serves many functions and is often the hub of your family’s history. It is the epicenter of your families china, photos, and keepsakes gathered over the years. A large cabinet can hold several sets of china, newer sets and sets passed down over the generations. The upper display shelves can be lighted to show off your precious family keepsakes and put a smile on your face every time you walk by. In the bustle of family life, it is nice to know your special, delicate keepsakes and family china are stored away safely for use at gatherings and special occasions. A stunning china cabinet by Hoosier Crafts is built in the Arts and Crafts style with simple lines and attention to fine artisan detail. This increasingly popular style from the early twentieth century has never gone out of style because it’s functional and beautiful and reflects a truly unique time of craftsmanship in American history. It comes in two, three, or four-door styles that fit a variety of dining rooms. The cabinet comes with soft close doors and hinges and also has optional LED lights inside the upper cabinets. The hardware on the doors are square wooden knobs turned to resemble finely crafted diamonds that accent the gentle inward curves of the sides of the cabinet. Imagine this hand-built and lovingly finished work of art in your home! It is a piece that will last a lifetime and be lovingly passed down from generation to generation. It is truly a safe harbor for heirlooms that are priceless to your family and new china that you collect over the years. Amish Furniture Showcase has been offering hand built, hand finished, fine furniture since 2002. Our beautiful furniture is built by skilled Amish and Mennonite Craftsmen from carefully selected North American hardwood. Our pieces work wonderfully together blending in with any home design style as only natural woods can. If you would like to learn more about this Arts and Crafts china cabinet or other pieces we offer in the Arts and Crafts style, please, contact us!